The Fortnite World Cup is a professional Fortnite tournament that takes place on weekends from April 13th to June 16th, 2019. Each weekend there will be a two day tournament (Saturday / Sunday) that Fortnite players can compete in to win their share of $1,000,000. Each event that occurs will have two events, an online-open semi-finals and an online open finals. Every other weekend will feature either a solos tournament or a duos tournament. Each server region will have their own shot at advancing to the Fortnite World Cup Finals where they can compete for part of a $30,000,000 prize pool – the largest prize pool in Fortnite history. The online open semi-finals will take place on Saturdays. The online open semi-finals is a 3 hour session where players can play a maximum of 10 matches per session. Scoring for the session is based on eliminations and match placement. 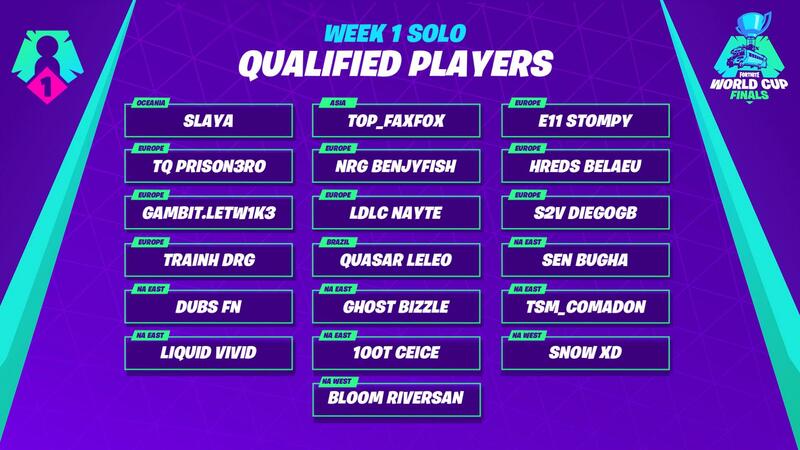 The top 3,000 solo players or 1,500 duos in the online open semi-finals will advanced to the online open finals on Sunday. Eliminations: Each elimination is worth 1 point. Eliminations are counted when they appear in the elimination feed as you getting the final blow on an enemy. At the end of each weekend event players will be reward with cash prizes along with qualification for the World Cup. Firstly, I am a father of 2. Secondly, I’m a web developer living in Marysville, Washington. I am a fan of entrepreneurship, programming, and sports. I’m also interested in video games and technology. GameGuideHQ © 2019. All Rights Reserved.